I need to take care of myself. What does it look like to you to take care of yourself? There’s basic hygiene, water, nutrition – you know, the basics. I’m just wondering how other full time working moms take care of themselves. I remember doing it when my son was a toddler up until the time I got pregnant with the twins. I did it with the help of having a membership to the Y, and then being a group fitness instructor. So that kept me accountable because if I didn’t show up to class then class didn’t happen. But now that I have twins and I’m back at work, I don’t really know what it looks like to take care of myself during this season. I know sleep is a huge priority (as I yawn). I know that spending time with God is a priority, but it seems like it’s something I don’t ever get around to, not how I used to, not how I’d like to. I haven’t worked out in a really long time and I can feel my body craving all the good chemicals I get from working out. I know I need to go out on a date with my husband. It feels like it’s been forever since we went somewhere that wasn’t church or with family. I know there are things I can do to take care of myself, I just don’t see how to juggle it all. I’m missing margin in my day. I need white space. I need…how do you clear things off of your calendar and to-do list when all of the stuff has to be done? I have a friend of mine at work who used to joke with me “Reina, all you need to do is get yourself a wife.” All I know is I feel overwhelmed and spent. So if you’ve got tips or suggestions on how to refocus energy and time, I’d love to hear them. I’ve been back at work for three weeks now. Of those three weeks, we have had grandparents from California (two different sets) for all of four or five days. Which means that dinner has been prepared for us one way or another for most of the last five weeks. It’s been great, but we’re not slated to have house guests again until late October. As our leftovers have been dwindling, reality has been setting in. I’ve got to start cooking again. But the idea of cooking now that I’m back at work seemed daunting and completely overwhelming. So I did what any working mom of three would do – I scoured the Interweb (yes, another Jon Acuff reference) for ideas. Before getting pregnant with the Floyd Twins, I was eating clean – at least 80/20. But the combo of exhaustion + hunger = anything goes diet has rewired my taste buds, and not for the better. As a nursing mom of twins I still need to eat about 3,000 calories a day and what seems like a ridiculous amount of protein. So, rather than trying to go super clean, I’m focusing on eating more real food in the most convenient way possible. So after doing a search for “frozen to crock pot paleo meals” I found the Paleo Made Simple site. I decided to prepare 6 of the 7 freezer to crock pot meals (no one in our house is a fan of stuffed peppers). I have no clue if they’re going to be any good, but so far I’m sold on the process. With the help of my seven year old son, Minifleeze, I prepped SIX MEALS in under 2 hours. I cleared the counter after every meal bag so by the end there was very little clean up needed. We’re having a meal each day this week and hopefully there will be enough leftovers for me to take to work for lunch. I’ll report back with everyone’s thoughts. 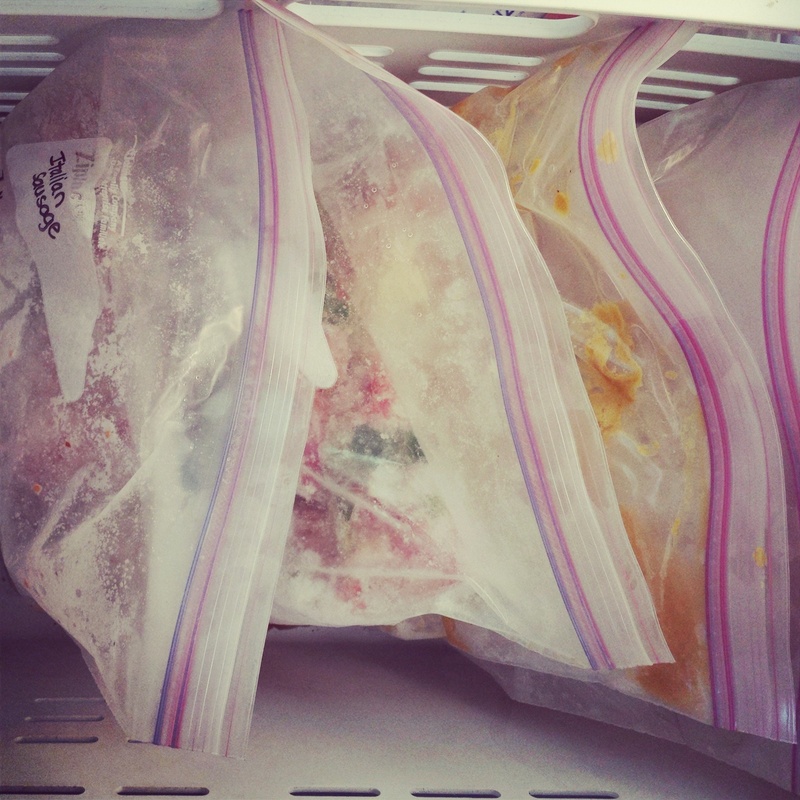 Do you have any good freezer to crock pot recipes or resources? I officially return to work tomorrow. 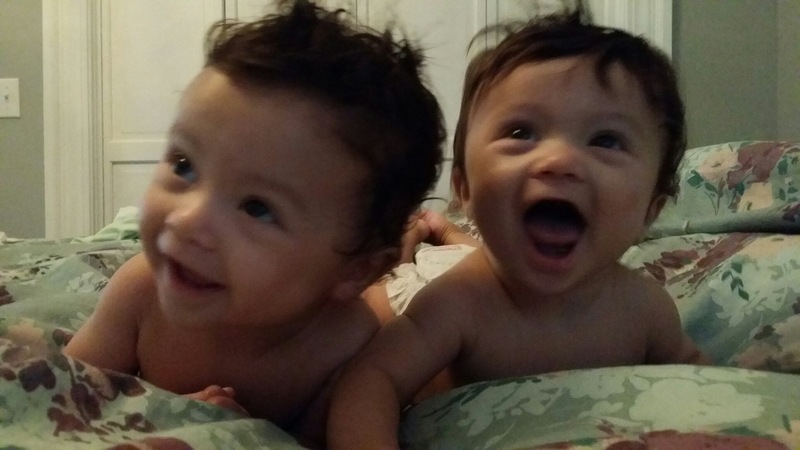 The twins are starting daycare today, though. We are trying to create a new routine so our mornings are as stress free as possible. Also, I need a day to be away from them before I have to be at work all day. Although I’m not dreading returning to work as much as I was, say three weeks ago, I still feel I have a bit of mourning left to do. Today will be an opportunity to process this new chapter without the fear of crying in front of my colleagues. My prayer today, and every day for the foreseeable future, is that when I get choked up by thinking of them, that God would replace my sorrow with gratitude and joy, and that I can live each day intentionally, as to not waste any time I get to spend with them, our oldest son, or my husband. I will also pray that God allows me to leave the world of 8-5 (fellow teachers, let’s just all make believe for the sake of this post, okay?) so I can be as present in the lives of my children as my heart desires. ps – I’ve got no idea what we’re supposed to pack for the boys, so as soon as I finish my PiYo workout I will be calling to get that info. So much for today being a stress free morning.